Event Construal in Speech and Gesture. Body – Language – Communication. Body Memory, Metaphor and Movement. Metaphors Dead and Alive, Sleeping and Waking. A Dynamic View. Gestural Communication in Nonhuman and Human Primates. The Semantics and Pragmatics of Everyday Gestures. Redebegleitende Gesten. Kulturgeschichte - Theorie - Sprachvergleich. Für das Inhaltsverzeichnis der einzelnen Ausgaben klicken Sie bitte auf das jeweilige Cover. Bressem, Jana, Silva H. Ladewig, Cornelia Müller (2018). Ways of expressing action in multimodal narrations - The semiotic complexity of character viewpoint depictions. In: Anika Hübl and Markus Steinbach (eds. ), Linguistic Foundations of Narration in Spoken and Sign Languages, 223–250. Amsterdam: Benjamins. Bressem, Jana and Cornelia Müller (2017). The “Negative-Assessment-Construction” – A multimodal pattern based on a recurrent gesture? In: Linguistics Vanguard. A Multimodal Journal for the Language Sciences. 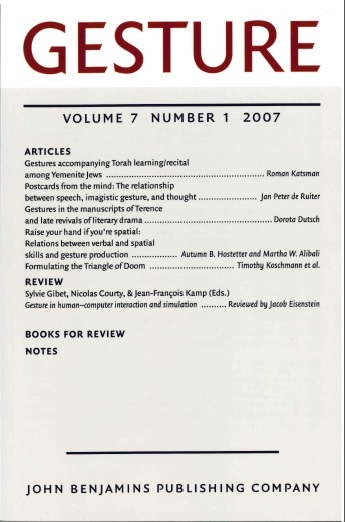 Special Issue „Towards a Multimodal Construction Grammar“, 3(s1). Müller, Cornelia (2017). Waking Metaphors. Embodied Cognition in Multimodal Discourse. In: Beate Hampe (ed. ), Metaphor. Embodied Cognition in Discourse, 297–316. Cambridge: Cambridge University Press. Müller, Cornelia (2017). How recurrent gestures mean: Conventionalized contexts-of-use and embodied motivation. Gesture,16(2): 277–304. Müller, Cornelia (2016). 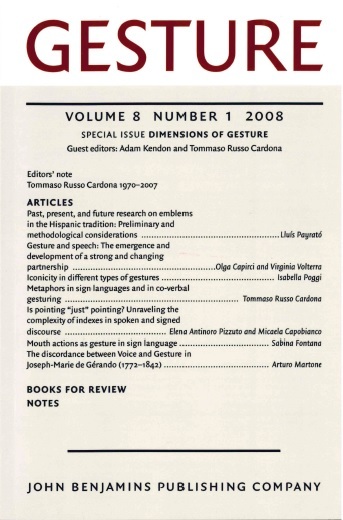 From mimesis to meaning: A systematics of gestural mimesis for concrete and abstract referential gestures. In: J. Zlatev, G. Sonesson, & P. Konderak (eds. ), Meaning, mind and communication: Explorations in cognitive semiotics. Frankfurt am Main: Peter Lang. Müller, Cornelia (2016). Why mixed metaphors make sense. In: Raymond Gibbs (ed. ), Mixing Metaphors, 31-56. Amsterdam/ Philadelphia: John Benjamins. Müller, Cornelia (2015). Using Gestures with Speech: Variable Cognitive-Semantic and Pragmatic Relations. MSLU Vestnik, 6(717): 452-466. Müller, Cornelia (2014). Gestures as "deliberate expressive movement". In: Mandana Seyfeddinipur and Marianne Gullberg (eds. ), From Gesture in Conversation to Visible Action as Utterance, 127-152. Amsterdam: John Benjamins. Müller, Cornelia (2014). The Ring across space and time: Variation and stability of forms and meanings. In: Cornelia Müller, Alan Cienki, Ellen Fricke, Silva H. Ladewig, David McNeill and Jana Bressem (eds.) (2014). Body – Language – Communication: An international Handbook on Multimodality in Human Interaction. (Handbooks of Linguistics and Communication Science 38.2.). Berlin/ Boston: De Gruyter Mouton. Müller, Cornelia (2014). Gestural Modes of Representation as techniques of depiction. In: Cornelia Müller, Alan Cienki, Ellen Fricke, Silva H. Ladewig, David McNeill and Jana Bressem (eds.) (2014). Body – Language – Communication: An international Handbook on Multimodality in Human Interaction. (Handbooks of Linguistics and Communication Science 38.2.). Berlin/ Boston: De Gruyter Mouton. Bressem, Jana and Cornelia Müller (2014). 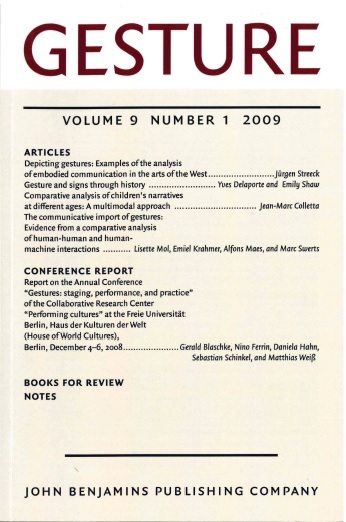 A repertoire of German recurrent gestures with pragmatic functions. In: Cornelia Müller, Alan Cienki, Ellen Fricke, Silva Ladewig, David McNeill and Jana Bressem (eds.) (2014). Body – Language – Communication: An international Handbook on Multimodality in Human Interaction. (Handbooks of Linguistics and Communication Science 38.2.). Berlin/ Boston: De Gruyter Mouton. Bressem, Jana and Cornelia Müller (2014). The family of away-gestures: Negation, refusal, and negative assessment. In: Cornelia Müller, Alan Cienki, Ellen Fricke, Silva H. Ladewig, David McNeill and Jana Bressem (eds.) (2014). Body – Language – Communication: An international Handbook on Multimodality in Human Interaction. (Handbooks of Linguistics and Communication Science 38.2.). Berlin/ Boston: De Gruyter Mouton. Cienki, Alan and Cornelia Müller (2014). Ways of viewing metaphor in gesture. In: Cornelia Müller, Alan Cienki, Ellen Fricke, Silva H. Ladewig, David McNeill and Jana Bressem (eds.) (2014). Body – Language – Communication: An international Handbook on Multimodality in Human Interaction. (Handbooks of Linguistics and Communication Science 38.2.). Berlin/ Boston: De Gruyter Mouton. Fricke Ellen, Jana Bressem and Cornelia Müller (2014). Gesture families and gestural fields. In: Cornelia Müller, Alan Cienki, Ellen Fricke, Silva H. Ladewig, David McNeill and Jana Bressem (eds.) (2014). Body – Language – Communication: An international Handbook on Multimodality in Human Interaction. (Handbooks of Linguistics and Communication Science 38.2.). Berlin/ Boston: De Gruyter Mouton. Horst, Dorothea, Franziska Boll, Christina Schmitt and Cornelia Müller (2014). 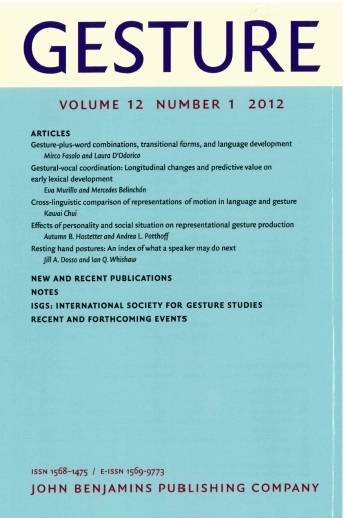 Gestures as interactive expressive movement: Inter-affectivity in face-to-face communication. In: Cornelia Müller, Alan Cienki, Ellen Fricke, Silva H. Ladewig, David McNeill and Jana Bressem (eds.) (2014). 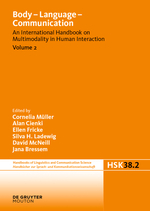 Body – Language – Communication: An international Handbook on Multimodality in Human Interaction. (Handbooks of Linguistics and Communication Science 38.2.). Berlin/ Boston: De Gruyter Mouton. Müller, Cornelia and Silva H. Ladewig (2013). Metaphors for Sensorimotor Experiences: Gestures as Embodied and Dynamic Conceptualizations of Balance in Dance Lessons. In: Michael Borkent, Barbara Dancygier and Jennifer Hinnell (eds. ), Language and the Creative Mind, 295–324. 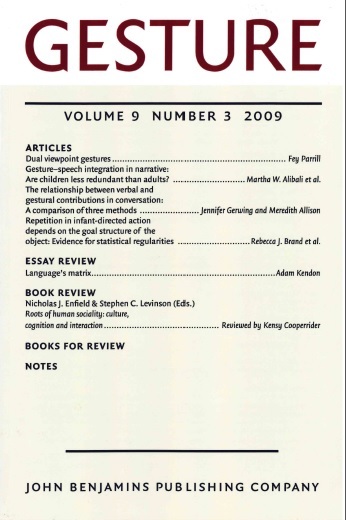 CSDL volume. Stanford: Stanford University. Müller, Cornelia (2013). Introduction. 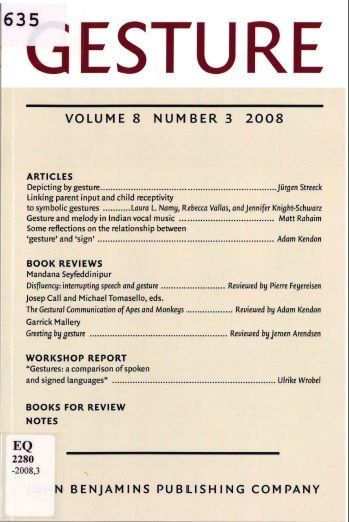 In: Cornelia Müller, Alan Cienki, Ellen Fricke, Silva H. Ladewig, David McNeill and Sedinha Teßendorf (eds.) (2013). Body – Language – Communication: An international Handbook on Multimodality in Human Interaction. (Handbooks of Linguistics and Communication Science 38.1. ), 1–6. Berlin/ Boston: De Gruyter Mouton. Müller, Cornelia, Silva H. Ladewig and Jana Bressem (2013). 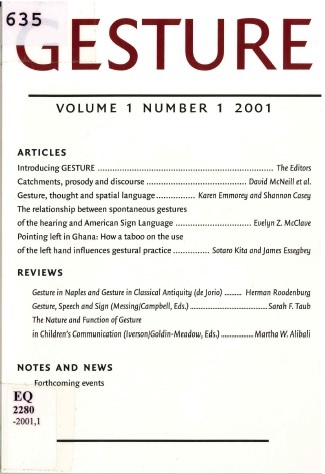 Gestures and speech from a linguistic perspective: A new field and its history. In: Cornelia Müller, Alan Cienki, Ellen Fricke, Silva H. Ladewig, David McNeill and Sedinha Teßendorf (eds.) (2013). Body – Language – Communication: An international Handbook on Multimodality in Human Interaction. (Handbooks of Linguistics and Communication Science 38.1. ), 29–55. Berlin/ Boston: De Gruyter Mouton. Müller, Cornelia (2013). 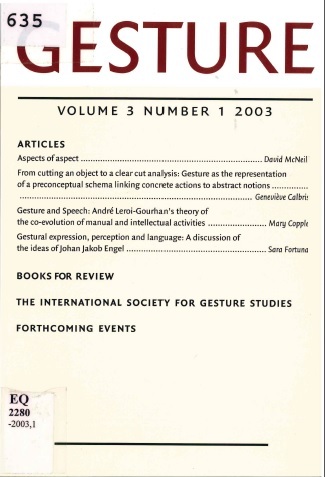 Gestures as a medium of expression: The linguistic potential of gestures. In: Cornelia Müller, Alan Cienki, Ellen Fricke, Silva H. Ladewig, David McNeill and Sedinha Teßendorf (eds.) (2013). Body – Language – Communication: An international Handbook on Multimodality in Human Interaction. (Handbooks of Linguistics and Communication Science 38.1. ), 202–217. Berlin/ Boston: De Gruyter Mouton. Müller, Cornelia, Jana Bressem and Silva H. Ladewig (2013). 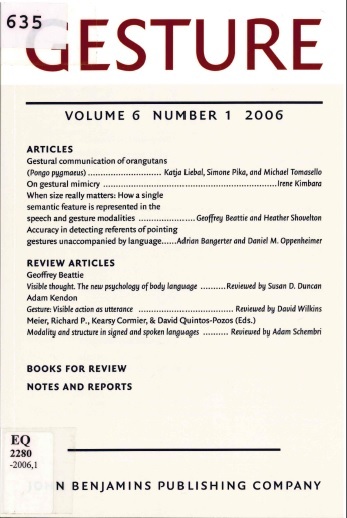 Towards a grammar of gestures: A form-based view. 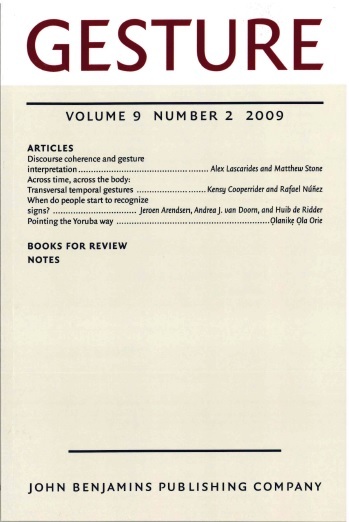 In: Cornelia Müller, Alan Cienki, Ellen Fricke, Silva H. Ladewig, David McNeill and Sedinha Teßendorf (eds.) (2013). Body – Language – Communication: An international Handbook on Multimodality in Human Interaction. (Handbooks of Linguistics and Communication Science 38.1. ), 707–732. Berlin/ Boston: De Gruyter Mouton. Bressem, Jana, Silva H. Ladewig and Cornelia Müller (2013). Linguistic Annotation System for Gestures (LASG). 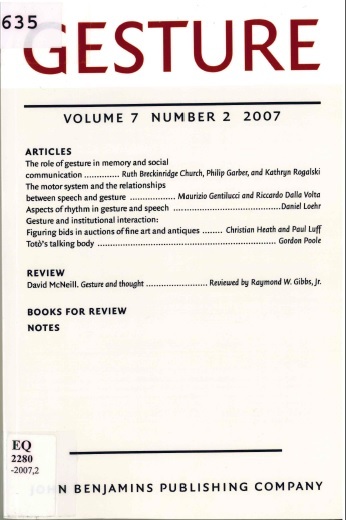 In: Cornelia Müller, Alan Cienki, Ellen Fricke, Silva H. Ladewig, David McNeill and Sedinha Teßendorf (eds.) (2013). Body – Language – Communication: An international Handbook on Multimodality in Human Interaction. (Handbooks of Linguistics and Communication Science 38.1. ), 1098–1124. Berlin/ Boston: De Gruyter Mouton. Kolter, Astrid, Silva H. Ladewig, Michela Summa, Cornelia Müller, Sabine C. Koch and Thomas Fuchs (2012). Body memory and the emergence of Metaphor in movement and speech. An interdisciplinary case study. In: Sabine Koch, Thomas Fuchs and Cornelia Müller (eds. ), Body Memory, Metaphor, and Movement, 201–226. Amsterdam/ Philadelphia: John Benjamins. Müller, Cornelia (2011). Reaction Paper Are ‘deliberate’ metaphors really deliberate? A question of human consciousness and action. Metaphor and the Social World, 1(1): 61–66. Erschienen als Are `deliberate`metaphors really special? : Deliberateness in the light of metaphor activation. Müller, Cornelia (2011). Postscript. A semiotic and linguistic perspective on gestures. In: Geneviève Calbris (2011). Elements of Meaning in Gesture, 367–368. Amsterdam: John Benjamins. Kappelhoff, Hermann and Cornelia Müller (2011). Embodied meaning construction. Multimodal metaphor and expressive movement in speech, gesture, and feature film. Metaphor and the Social World, 1(2): 121–153. Müller, Cornelia (2010). Wie Gesten bedeuten. Eine kognitiv-linguistische und sequenzanalytische Perspektive. In: Irene Mittelberg (ed. ), Sprache und Gestik. Sonderheft der Zeitschrift Sprache und Literatur, 41(1): 37–68. Müller, Cornelia (2010). Mimesis und Gestik. In: Gertrud Koch, Martin Vöhler and Christiane Voss (eds. ), Die Mimesis und ihre Künste, 149–187. Paderborn: Fink. Müller, Cornelia and Susanne Tag (2010). The Dynamics of Metaphor: Foregrounding and Activating Metaphoricity in Conversational Interaction. Cognitive Semiotics, 6: 85–120. Müller, Cornelia (2009). Gesture and Language. In: Kirsten Malmkjaer (ed. 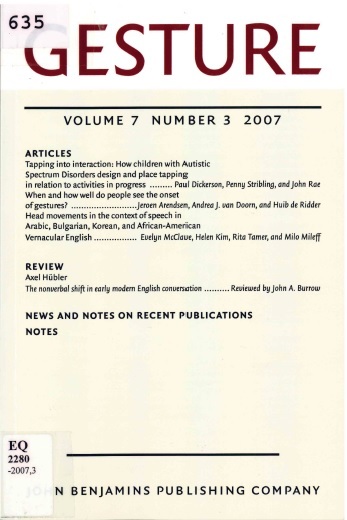 ), Routledge's Linguistics Encyclopedia, 214–217. Abington/ New York: Routledge. Müller, Cornelia and Alan Cienki (2009). Words, gestures, and beyond. Forms of multimodal metaphor in the use of spoken language. In: Charles Forceville and Eduardo Urios-Aparisi (eds. ), Multimodal Metaphor, 297–328. Berlin/ New York: De Gruyter Mouton. Müller, Cornelia (2008). What gestures reveal about the nature of metaphor. In: Alan Cienki and Cornelia Müller (eds. ), Metaphor and Gesture, 219–245. Amsterdam: John Benjamins. Müller, Cornelia (2008). Wie man aneinander vorbei gestikulieren kann... Gesten als Quelle intra- und interkultureller Missverständnisse. In: Veit Didczuneit, Anja Eichler and Lieselotte Kugler (eds. ), Missverständnisse - Stolpersteine der Kommunikation, 102–109. Edition Braus (Exhibition catalog of the Museum for Communication Berlin). Cienki, Alan and Cornelia Müller (2008). Metaphor, gesture and thought. In: Raymond W. Gibbs (ed. ), Cambridge Handbook of Metaphor and Thought, 483–501. Cambridge: Cambridge University Press. Müller, Cornelia (2007). Gestures in human and nonhuman primates: Why we need a comparative view. In: Katja Liebal, Cornelia Müller and Simone Pika (eds. 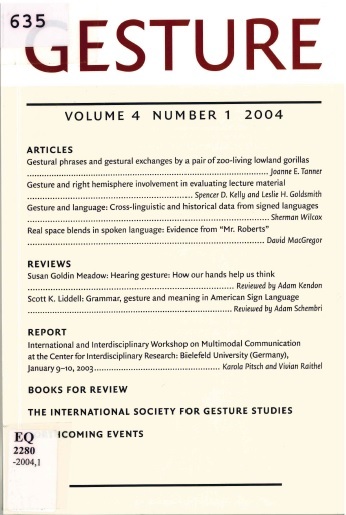 ), Gestural Communication in Nonhuman and Human Primates, 237–260. Amsterdam/ Philadelphia: John Benjamins. Müller, Cornelia (2007). A Dynamic View on Metaphor, Gesture and Thought. In: Susan D. Duncan, Justine Cassell and Elena T. Levy (eds. 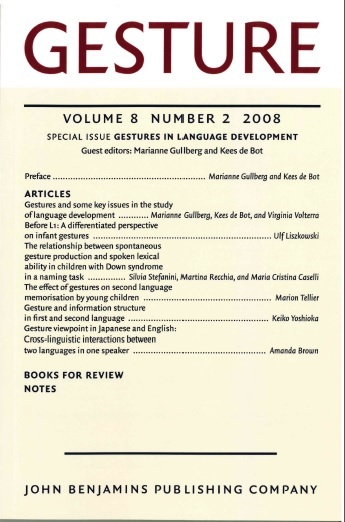 ), Gesture and the Dynamic Dimension of Language. Essays in Honor of David McNeill, 109–116. Amsterdam/ Philadelphia: John Benjamins. Müller, Cornelia (2007). A Semiotic Profile: Adam Kendon. Semiotix, 9. Müller, Cornelia and Ulrike Bohle (2007). Das Fundament fokussierter Interaktion. Zur Vorbereitung und Herstellung von Interaktionsräumen durch körperliche Koordination. In: Reinhold Schmitt (ed. ), Koordination. Analyse zur multimodalen Kommunikation, 129–165. Tübingen: Narr. Müller, Cornelia, Katja Liebal and Simone Pika (2007). Gestural communication in human and nonhuman primates: Introduction. In: Katja Liebal, Cornelia Müller and Simone Pika (eds. 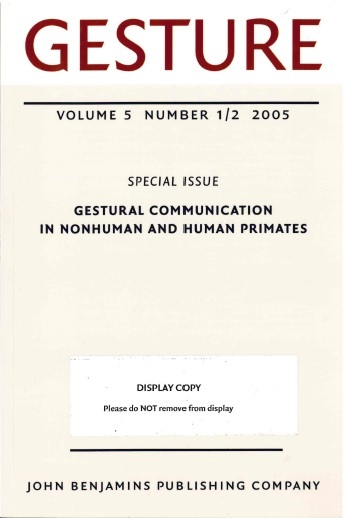 ), Gestural communication in nonhuman and human primates, 1–4. Amsterdam/ Philadelphia: John Benjamins. Müller, Cornelia (2005). Gestures in human and nonhuman primates: Why we need a comparative view. Gesture, 5(1-2): 259–283. Müller, Cornelia and Katja Liebal (2005). Gestural communication in human and nonhuman primates: Introduction. Gesture, 5(1-2): 1–5. Müller, Cornelia (2004). The Palm-Up-Open-Hand. A case of a gesture family? In: Cornelia Müller und Roland Posner (eds. 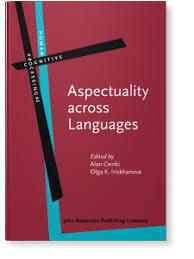 ), The semantics and pragmatics of everyday gestures. The Berlin Conference, 233–256. Berlin: Weidler. Müller, Cornelia and Katja Liebal (2004). Conference Report: Gestural Communication in human and nonhuman primates, workshop held in Leipzig. Gesture, 4(2): 255–263. Müller, Cornelia and Roland Posner (2004). Introduction. In: Cornelia Müller und Roland Posner (eds. ), The semantics and pragmatics of everyday gestures. The Berlin conference, Berlin: Weidler. Müller, Cornelia (2003). On the gestural creation of narrative structure: A case study of a story told in a conversation. In: Isabella Poggi, Monica Rector and Nadine Trigo (eds. 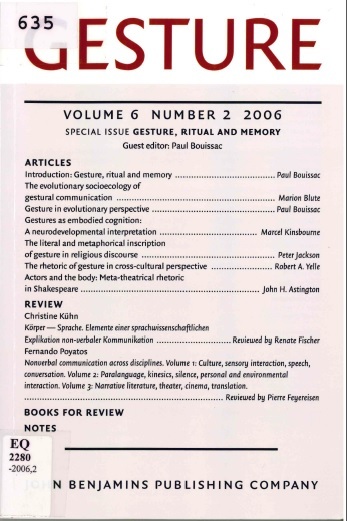 ), Gestures: Meaning and Use, 259–265. Porto: Universidade Fernando Pessoa. Müller, Cornelia (2003). Gesten als Lebenszeichen 'toter Metaphern'. Zeitschrift für Semiotik, 25(1–2): 61–72. Müller, Cornelia (2002). Eine kleine Kulturgeschichte der Gestenbetrachtung. Psychotherapie und Sozialforschung, 4(1): 3–29. Müller, Cornelia (2002). 'Etwas bis zur Vergasung tun' – Sprachtabu als kollektive Trauerarbeit? In: Hartmut Eggert and Janusz Golec (eds. ), Literarische und sprachliche Strategien im Umgang mit gesellschaftlichen Tabus, 43–62. Stuttgart: Metzler. Müller, Cornelia (2002). 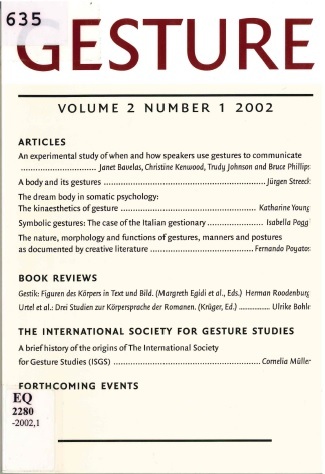 A brief history of the origins of 'The International Society for Gesture Studies' (ISGS).Gesture, 2(1): 127–132. Müller, Cornelia (2002). Conference Report: Gesture: The living medium. 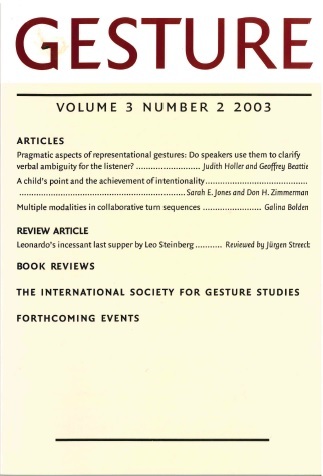 The first congress of the International Society of Gesture Studies held at the College of Communication, the University of Texas at Austin, June 5–8, 2002. Gesture, 2(2): 291–302. Müller, Cornelia and Gerald Speckmann (2002). Gestos con una valoración negativa en la conversación cubana. DeSignis, 3: 91–103. Müller, Cornelia and Kerstin Schoor (2002). Jahrhundertreform als Kahlschlagsanierung. Mitteilungen des Germanistenverbandes, 49(1): 24–42. Müller, Cornelia (2001). Gesture-space and culture. In: Christian Cavé, Isabelle Guaitella and Serge Santi (eds. ), Oralité et Gestualité: Interactions et comportements multimodaux dans la communication, 565–571. Montréal/ Paris: L’Harmattan. Müller, Cornelia and Adam Kendon (2001). Introducing GESTURE. 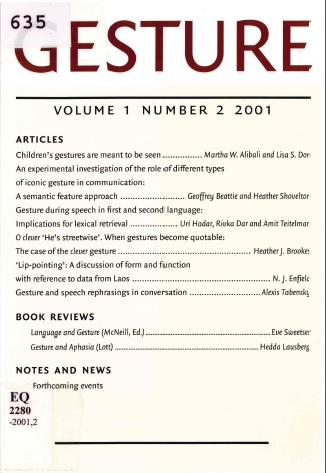 Gesture, 1(1): 1–7. Müller, Cornelia (2000). Zeit als Raum. Eine kognitiv-semantische Mikroanalyse des sprachlichen und gestischen Ausdrucks von Aktionsarten. In: Ernest W.B. Hess-Lüttich and H. Walter Schmitz (eds.) Botschaften verstehen. Kommunikationstheorie und Zeichenpraxis. 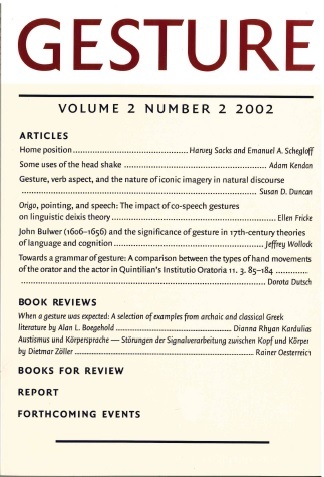 Festschrift für Helmut Richter, 211–228. Frankfurt: Peter Lang. Müller, Cornelia and Paul Ingwer (1999). Gestikulieren in Sprechpausen. Eine konversations-syntaktische Fallstudie. In: Hartmut Eggert and Janusz Golec (eds. ), „... wortlos der Sprache mächtig“. Schweigen und Sprechen in der Literatur und sprachlicher Kommunikation, 265–281. Stuttgart: Metzler. Müller, Cornelia (1998). Beredte Hände. Theorie und Sprachvergleich redebegleitender Gesten. In: Thomas Noll and Caroline Schmauser (eds. ), Körperbewegungen und ihre Bedeutungen, 21–44. Berlin: Berlin Verlag. Müller, Cornelia (1998). Iconicity and gesture. In: Serge Santi (ed. ), Oralité et Gestualité: Communication Multimodale, Interaction, 321–328. Montréal/ Paris: L’Harmattan. Müller, Cornelia (1998). Wahrnehmung, Sprache und Denken. In: André Lund (ed. ), Kommunikation. Studienband 3, Teil 2, 54–81. Berlin: PR Kolleg. Müller, Cornelia and Harald Haferland (1997). Gefesselte Hände. Zur Semiose performativer Gesten. Mitteilungen des Germanistenverbandes, 3: 29–53. Müller, Cornelia (1996). Zur Unhöflichkeit von Zeigegesten. OBST , 52: 196–222. Müller, Cornelia (1994). Cómo se llama ...? Kommunikative Funktionen des Gestikulierens in Wortsuchen. In: Peter-Paul König and Helmut Wiegers (eds. ), Satz – Text – Diskurs. Akten des 27. Linguistischen Kolloquiums, Münster 1992, 71–80. Tübingen: Niemeyer. Müller, Cornelia (1994). Semantic structure of motional gestures and lexicalization patterns in Spanish and German descriptions of motion events. In: Katharine Beals (ed. ), CLS 30. Papers from the 30th regional meeting of the Chicago Linguistic Society. Pt. 1: The main session, 281–295. Chicago: Chicago Linguistic Society.